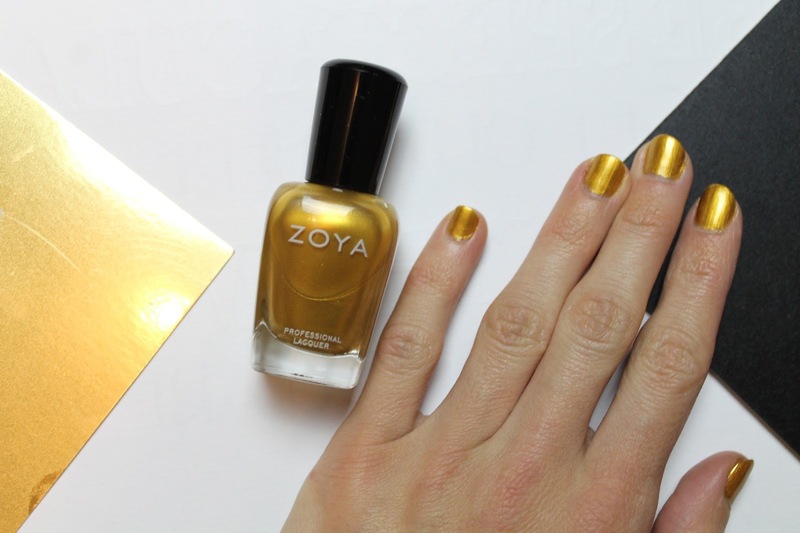 Catch your breath, this bottle of gold gloriousness is Zoya's Nail Laquer in 'Goldie'* holy cow it is stunning! I'm so used to seeing cool toned golds, that when I saw this richly yellow based gold nail colour, I had to have it. It was a gamble but it sure did pay off! I tried to take this polish in a number of different lights so you can truly appreciate the colour. It was tricky but hopefully you get the full scale of how incredible this colour is! Now I love Zoya as a brand and I have several of their polishes. They have a huge range of colours and are free from Formaldehyde, Toluene, DBP and Camphor. I find Zoya to be really high quality in their formulas, long lasting quite chip resistant and they always have great colour and coverage. This Goldie polish is no exception. One coat give a good patch-free finish with strong colour, but two coats really makes the colour pop and make an impact. Goldie as I said and as you can see, is a very yellow based gold shade, so unique and unusual. When I first applied this polish I really wasn't keen but after letting it dry and spending time doing that hand-out-in-front-wiggling-fingers-in-the-light thing we girls always seem to do to admire our nails, I fell for it. Hard. I love the super metallic look it has, and it is a slight shimmer effect. It's shimmery, metallic and has a slight shine all in one. Gorgeous! It's not glittery though which is good. On my nails below I'm wearing two coats- badly applied, I'll admit but it is quite easily to apply, I just have zero skills or patience. There is a tiny bit of streaking in the effect, but not streaking so badly that it leaves gaps, simply there's a brush stroke effect in the polish, I know partly due to my appalling application and I think just due to the metallic nature of the polish. It doesn't detract from the overall effect though. For the wear, this polish holds up as well as any of the other Zoya shades. It lasts a good 4-5 days with a slight hint of tip wear after day three and chipping after five if you have it without a top coat. Another great factor about this polish is that it doesn't have a very strong scent which is great for me and for anyone in the room when I'm painting my nails. In short this polish is exactly as luxurious as i hoped it would be! It's become rather a staple on my nails now. Oh and i is also worth noting that it doesn't stain your nails at all, even when you wear it without a base coat. See it truly is perfection. The specifics: This polish really is worth it's weight in gold! It's £10 and available from LoveLula. Currently as I write this, it is sadly out of stock, but I feel sure that this will be back in stock soon -if you are really an eager beaver, you can sign up to be notified when this pot of gold comes back into stock. I would highly advise getting one. You'll just fall in love. Really you will. This color is perfect for New Year Eve.